ERA members at the 2004 Convention returning to a chartered VTA Light Rail car after a photo stop at the Old Ironsides Station during the San Jose day trip. The late Frank S. Miklos, then president of the ERA, is on the right in the foreground; behind him, from left, are John Pappas and Ray Berger. ERA Trip and Convention Chairman Jack May boards VTA Light Rail car at Old Ironsides Station. Looking out the rear cab of VTA Kinki Sharyo LRV at the view of the northern end of the 1.4-mile elevated structure which is the signature feature of the new Tasman East-Capitol light rail extension. Two stations are located on the elevated portion, one of which serves the Great Mall shopping complex. The extension opened just weeks prior to the ERA Convention. A two-car train of Kinkis, the usual consist, heads northbound along the generous right-of-way in the middle of the Capitol Expressway bound for Santa Teresa station in South San Jose. VTA 923 shows one of the elevated stations, Montague, as it travels north and westward from the terminal at Alum Rock to Mountain View Caltrain Station. This “modified T” service pattern was later changed so the Capitol route was served by main trunk trains to and from Santa Teresa. Ex-Milan Peter Witt 2001 serves as the overflow fan trip car, seen here along the downtown “sidewalk” right-of-way. A member enjoys the view out the front of historic car 1 during a fan trip through downtown San Jose. Historic cars are stored in a special bay at VTA’s Light Rail Division off Younger Street. Car 1 was built in 1903 for service in Sacramento, but spent most of its life in Santa Cruz. It was restored by the San Jose Trolley Corporation in 1985. The San Jose Trolley Corporation shop, a seemingly magic place where six streetcars were brought back to life by some of the most skilled and knowledgeable craftsmen in the industry in the 1980s and early ’90s. The program is over, at least for now, but the products of that remarkable time are still around for traction enthusiasts to enjoy, hopefully for a long time to come. Central Railroad Company (San Francisco) horsecar 7 is posed just outside the shop. This car dates from 1863. A view inside the shop where cars were reconstructed, largely from weathered and often incomplete bodies. Seen in the background is a cable car, California Street 23, built in 1910 and awaiting further restoration. Car 124 does the honors on the tourist line at History Park at Kelley Park during ERA’s Saturday visit. Built for San Jose Railroads in 1912, it ran from 1988 until 1999 on VTA’s downtown historic trolley loop and has since been repatriated to the place where it was re-born from a body shell in the mid-1980s. The tower above the car contains an arc lamp which was used to illuminate the town at night during the early days of electricity. Near the entrance to History Park, a seldom used piece of trackage that serves as a spur. It saw use during ERA’s visit to allow one service car to pass the other. Car 143, a Fresno Traction Co. Birney dating from 1922, serves as the second car on the Historic Village Main Street streetcar line during ERA’s visit. Our Muni excursion presented attendees with the opportunity to ride PCCs where they don’t normally go, in this case along the Embarcadero on the N line, the exclusive domain of Breda LRVs. 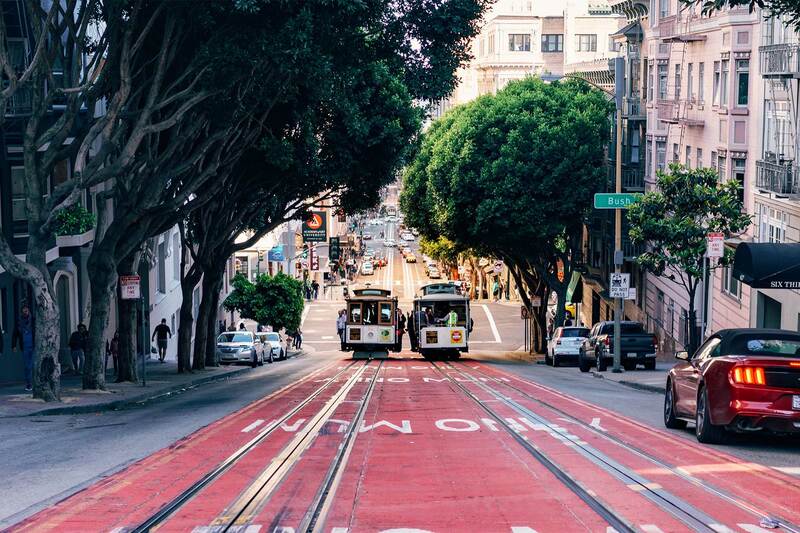 Muni has eventual plans for an E line, which will one day see regular streetcar service on this portion of track, intermingling with the LRVs and continuing north to Fisherman’s Wharf. The end of the line for wide cars. The crossover at Carl and Hillway is as far out on the N line as conventional cars can travel due to restrictive clearances at the inbound wheelchair ramp at 9th & Judah. In this view, 9-foot wide “Torpedo” 1010 (St. Louis 1948) waits until its sister Torpedo 1007 and New Orleans 952 have their turn over the crossover. Stack-up on Jones Street. The three ERA excursion cars meet the regular service F car at its regular layover spot at Jones & Beach in the Fisherman’s Wharf area. PCC 1055 (St Louis Car Co.) models the Philadelphia Transportation Company 1940’s scheme in which it was delivered as their 2122 in 1948. Down to the sea on a Boat. The normally unused trackage on mb-1val between 46th and 48th Avenues sees big activity for a few minutes in the afternoon while car 1010 operates to the end of trackage and the Blackpool, England Boat tram No. 228, a single-ender built in 1934, is backed down toward Great Highway, with the Pacific in the background. The crew of the Boat tram prepares the car for an afternoon out with the ERA convention attendees. Our host for the day was Peter Ehrlich, who is seen at the controls. New Orleans 952 emerges from the Sunset Tunnel at the west portal near Carl & Cole streets loaded with convention attendees. Still the pride of the F line, Muni car 1 of 1912, seen here at Market & O’Farrell. The car has since been taken out of service for a much needed rebuilding. Boeing 1320 wearing the Muni morph stripe scheme (copied from Philadelphia) and being prepared for duties as a wrecker, is on the loop track at Metro Yard. Nearing the end of an era under double overhead, Muni’s 28-year old Flyer trolley coaches were living on borrowed time. New ETI-Skoda 40-foot replacements had all arrived and delivery was well along on the 60-foot artic versions. At the time of our convention, the lower yard at Potrero was still home to over 25 of these workhorses. The last major concentration of Flyers was on line 6-Parnassus. Their assignment there finally succumbed to concerns over assuring the line’s accessibility. Coach 5277 is seen outbound on Haight Street at Baker in a shot taken from the steps of Buena Vista Park. A few Flyers ran well into 2007 as morning trippers on line 41-Union. At the time of our visit, Muni had just taken delivery of former Brussels, Belgium PCC 7037, seen tucked away inside Geneva yard. This car subsequently was painted in a commemorative Zurich tram scheme to honor that city’s Sister City status with San Francisco. It sees occasional use on the F line renumbered as 737. Peninsular Railways 52 was constructed in 1903 and served that Southern Pacific subsidiary, operating between San Jose and Saratoga until abandonment in 1934. It is seen here on the former SN mainline at Gum Grove Station on the day of our visit. The pride of the Western Railway Museum is its 22-mile mainline. The line is still situated away from development and gives the feel of what it must have been like to ride the Sacramento Northern on the part of the line north of the Sacramento River delta through the Montezuma Hills. That feeling is conveyed in this photo of Salt Lake and Utah observation 751 on the end of a three car train at Gum Grove Station during the ERA’s visit. Key System 352 is seen here painted in the scheme of the East Bay Street Railways, which it wore for much of the 1930s. The car was built to a standard wooden deck roof design in 1911 and extensively rebuilt during its 37-year career. ERA members, especially those from the east coast, were treated to a ride in a former Manhattan Elevated car, No. 844, brought to northern California during the early years of World War II and used to provide service on the Richmond Shipyard Railway, operating from Emeryville to Kaiser Shipyards. The car was built in 1887. Sacramento RT 219 at the Meadowview terminal of the South Line (now designated the Blue Line). The line was opened September 26, 2003. 219 is one of an order for 40 vehicles delivered in 2002–03 and was the first to be built for a North American customer by CAF of Spain. A line-up of other light rail equipment at the yard. Car 35 of Pacific Gas & Electric is used on occasion as RT’s historic car. 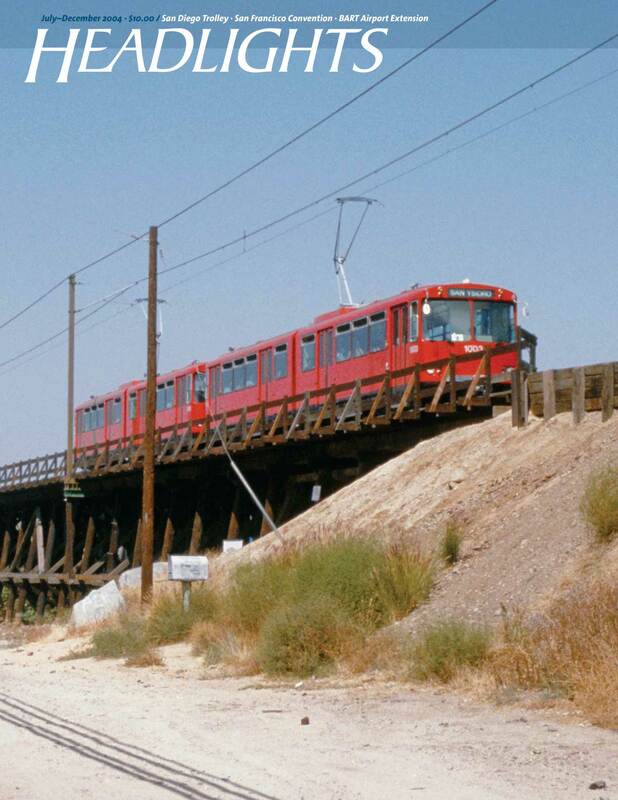 It was reconstructed by the San Jose Trolley Corporation in 1986. 314, built by UTDC in Thunder Bay, Ontario in 1986, was recently acquired from San Jose. 116 is a Siemens-Duewag U2A of 1987. 2004 was a year of continuing expansion in Sacramento, as the East Line (now part of the Gold Line) extended operation 2.8 miles from Mather Field-Mills to Sunrise. The extension contained three new stations, including this one at Cordova Town Center serving the separate city of Rancho Cordova. U2A 110 and train are westbound on June 11, 2004. The floor at Siemens Transportation Systems in Sacramento during ERA’s visit shows the variety of orders receiving final assembly. In the foreground are SD660 70% low-floor cars for Portland’s Max. Toward the rear are a couple of examples of high-floor SD 460s for St. Louis’ Metrolink, their fourth order for this model. One example (painted in signature red) of an S70 Avanto for San Diego Trolley stands out at the rear. St. Louis Metrolink 4002 poses in the delivery yard behind the plant. The plant has several hundred feet of track under live overhead for testing. The car has yet to receive the red and dark blue striping and Metro “M” logos. ERA members would encounter this car again on its home turf at the 2007 convention. The Electric Railroaders’ 2004 Convention will be held in San Francisco on Labor Day Weekend. This year’s convention headquarters is at the Wyndham Canterbury at San Francisco (formerly the Best Western Canterbury Hotel), conveniently located in the central area of the city at 750 Sutter Street. Spend a full day in the San Jose area, starting with a tour of Santa Clara Valley Transportation Authority’s Tasman West line and the new Capitol Corridor line in Ex-Milan Italy Peter Witt car 2001. Visit Carhouse and Shop and ride one of San Jose’s new low-floor articulated units. Ride the downtown loop in one or more cars from San Jose’s heritage collection. Ride beautifully-restored streetcars at Kelley Park trolley museum. Finish the day with Annual Slideshow at the Canterbury. Topic: Northern California traction. All-Day Municipal Railway Streetcar Fantrip through downtown on heritage fleet of the Municipal Railway of San Francisco. Change cars at Geneva Carhouse. Sample as many different types of cars as possible. ERA’s Annual Banquet in private room at the Canterbury. Guest Speaker: Peter Straus, Muni Manager of Service Planning. Visit Western Railway Museum in Rio Vista Junction. Ride Rio Vista’s collection of historic city cars. Sacramento Light railfantrip will cover all the lines in our own LRV, which will be attached to regular service trains. Visit Carhouse and Shop. Ride and photograph heritage car 35 as well as being able to photograph each of Sacramento’s three types of LRVs, hopefully posed together. Siemens Plant Tour featuring construction of new light rail vehicles for Charlotte, North Carolina. Revisit the San Francisco area with this special reprint of John Pappas’s article on the 2004 ERA Convention from the July–December 2004 issue of Headlights.